Medicines sold from this website are done so solely at the discretion of the pharmacist after establishing the appropriateness of the treatment. In the case of P (Pharmacy only) medicines this will involve a series of questions and in certain circumstances this may result in a telephone call from our pharmacist or referral in person to a pharmacist local to you. Due to UK law prescription medicine sales are restricted to U.K. patients only. All orders for products are subject to availability. In addition Numark pharmacy reserves the right to refuse to supply any individual, group of individuals or company for any reason. This website should be regarded as an invitation to treat. A confirmation email is notification that we have received your offer on our website. There is no binding contract for the purchase of products ordered via this Website until Numark Pharmacy issue a point of a sale invoice following checking of orders by a pharmacist. In the event that Numark Pharmacy decides not to meet your order, Numark pharmacy will refund any money you have paid within a reasonable time. If you are shopping from overseas place your order and your credit card company will convert the transaction to your own currency. We accept most credit cards including Visa, MasterCard via SagePay. In the event of an item being out of stock and we are unable to supply we will email you and refund fully, the total amount taken from your card. Shipping And Handling - Varies with destination see postal charges. For security timed delivery options are not available. 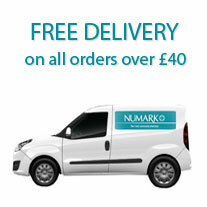 Delivery in the U.K. is free on all orders over £40 excl VAT. Orders below this are based on postage rate for Royal Mail Recorded Delivery (signature on delivery). Please note that we reserve the right to make a surcharge of up to £5 when orders are not delivered or have to be redelivered due to the absence of a recipient to sign for that order. For overseas delivery there may be an additional delivery charge dependent on destination and weight of goods. Upon ordering we will e-mail you with the details of any extra cost. It is the customers responsibility to check that there are no restrictions of entry for the items ordered to their particular country.We reserve the right to reclaim postage charges for any such restricted orders retuned to us. Any customs or importation fees placed on overseas orders will be met by the customer and not ourselves. Due to UK law we do not sell prescription only medicines abroad. The supply of other medicines to the USA is subject to the control of the US Customs and the FDA .As they cross the US border they may be delayed or not delivered at all. Numark pharmacy therefore does not currently supply medicines to America. For medicines needed under special circumstances please contact us direct. Tax Charges For orders made from the UK or the European Union, 20% VAT is added. All other orders (shipped and paid for outside the EU) are VAT free. The purchaser is responsible for any Import Duty and/or Taxes that may be charged by their own country. Please note, that you may be liable for customs duties on your order when it reaches your country. We do not collect or control these charges and we cannot predict what they will be. For more information and restrictions on importation of medicines and health products you may wish to contact your local customs office before ordering. ZERO VAT Some products are designed specifically to aid disability or severe injury can be purchased exempt of VAT. If you are registered disabled or have a long-term medical condition, you may qualify. If you do you can print off the exemption form and post to us so we can make sure no VAT is charged on your order of these items. You must be sure of your eligibility for VAT relief before completing the declaration. Section 39.2 of the VAT Act 1983 provides for severe penalties for anyone who makes use of a document which they know to be false for the purposes of obtaining VAT relief. The goods ordered must be for your personal or domestic use only. We can only accept an original document. Photocopies, facsimiles or electronic transmission are not acceptable. We retain the completed form for presentation to the VAT office only. It will not be used for any other purpose. Certain items for incontinence are zero-rated for VAT .These products differ from those products such as mobility/disability products which require a signed declaration of VAT eligibility by the customer for presentation to HM Customs and Excise. Guarantee We guarantee your satisfaction. All of our products except medicines come with a 28-day no quibble guarantee. However, shipping charges will not be refunded and you will be liable for the cost of returning items to us.Due to General Pharmaceutical council guidelines we cannot accept medicines for return unless they have been despatched wrongly or there is a product recall or fault with them. We highly recommend that items are returned via a Recorded Delivery service as we do not accept responsibility for items lost in the post. It is your responsibility to ensure the goods are adequately packaged to ensure that they are not damaged during return transit. Once notified, all items should be received at Numark Pharmacy within 30 days from the date of delivery for this condition to apply.